Named for a Dean Martin love song, Innamorata – translated from Italian as “lover” or “sweetheart” – this piece is a delicate summer tee with a wide neckline of dipping V’s on its front and back – very romantic. 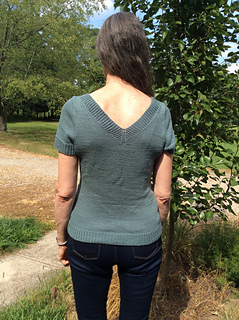 Worked entirely of simple stockinette and rib trimming, the bodice extends mid-hip in length with gentle shaping at the waist. 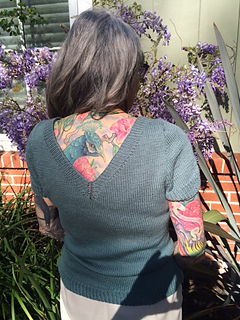 It is worked bottom-up in the round to the armholes, where it is then split and worked flat. 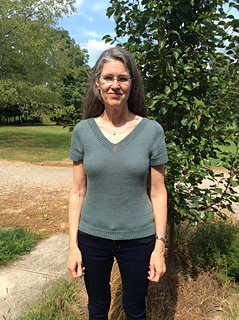 Short trimmed sleeves are knit flat and set-in. Shown in Venezia Sport by Cascade Yarns (70% merino wool/30% mulberry silk; 307.5 yds/281.25 m per 3.5 oz/100g skein); color – pure diamond #110; 3, 3, 4, 4, 4, 5, 5 skeins, or for comparable yarn, approximately 750, 840, 950, 1040, 1150, 1240, 1330 yards. 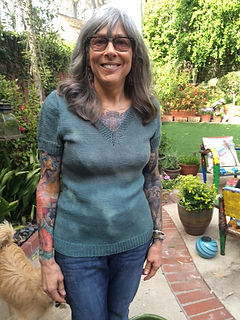 Knit, purl, long-tail CO, ssk, k2tog, circular knitting, m1R, m1L, p2tog, p2tog tbl, stitch pick up around neckline, 3 needle BO (at shoulders), blocking, and some seaming (at sleeve trim and armhole). 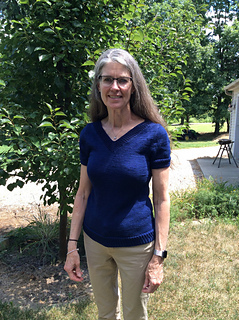 10 page pdf includes pattern instructions, photographs, schematics, assembly diagrams for stitch pickup around neckline and sewing sleeve cap into armhole, and definitions for relevant abbreviations.